Highly regarded for their musical honesty and superior value, PSB speakers have long been a favorite of audiophiles and industry insiders alike. With over 40 years of careful testing and listening under his belt, chief engineer Paul Barton and his design team have an almost uncanny knack for building loudspeakers with the ability to startle and delight. PSB's newest creation, the Imagine T2, is a perfect example. This gorgeous, floor-standing tower incorporates technology borrowed from their top-of-the-line Synchrony series, to raise the price/performance bar to new heights. The T2's open, natural sound will bring all your music and movie soundtracks to life with exquisite detail and stunning realism. Each woofer is isolated in its own sealed chamber to provide deeper, more accurate bass. The Imagine T2 uses a five-driver array made up of three woofers, a midrange, and a dome tweeter. Unlike many other designs, this speaker's tweeter sits just below the midrange and above the top woofer in an arrangement that's characteristic of PSB's high-end Synchrony line. Having the tweeter positioned lower along the baffle helps you experience the T2's full sonic range from low to high, whether you're seated or standing. The three woofers are strategically placed along the front baffle, allowing for more consistent sound dispersion. 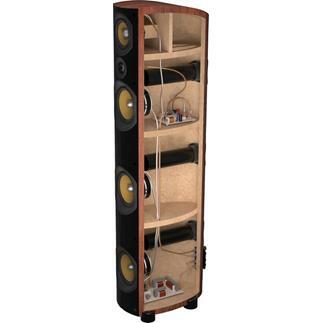 And each woofer is isolated in its own sealed chamber to provide more precise cabinet tuning. The result is powerful, controlled bass down to 34Hz. The T2's 1" titanium dome tweeter is engineered to produce smooth, accurate highs free from harshness and grain. The 4" midrange and 5-1/4" woofers use proprietary ceramic-filled polypropylene cones, which makes them very stiff and light. The result: you hear clear, highly detailed midrange, and bass that's tight and articulate. The T2's superbly accurate and stable stereo image pulls you deep into the soundstage for a totally immersive experience. Whether your tastes run to intense action flicks, hard-driving rock, or anything in between, these towers can handle whatever you throw at them. Beautifully curved outside and heavily braced inside, the T2's solid, acoustically inert cabinet helps resist sound-muddying vibrations. Each hand-crafted enclosure sports a surprisingly compact footprint that blends neatly into your room. The Black Ash and Dark Cherry models' top and side panels are clad in real wood veneer that's hand selected for its beauty and quality, while the Gloss Black model features a deep, mirror-like high-gloss exterior. Whichever finish you choose, you'll have both a visual and sonic masterpiece. 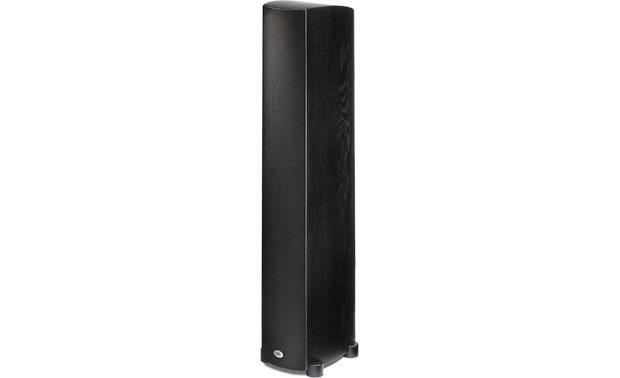 "These elegant floorstanding speakers of moderate size offer a surprisingly "big" sound, with dynamics sufficient to present large-scaled music convincingly and enough bass to cover orchestral and rock music, though pipe organ enthusiasts will want to add a subwoofer or two. The T2s vanish into the soundfield and present a suitably expansive sonic picture when the recording justifies it. They sound very low in distortion with a pure midrange and a very clean treble. And they have a truth to timbre, a tonal neutrality, that is top level, showing a clean pair of heels in this regard in particular to many high-end speakers of far higher price. Orchestras have a life-like tonal realism that is startling, pianos sound like pianos, vocals like people singing. Paul Barton has produced a masterpiece here, and at a most reasonable price." 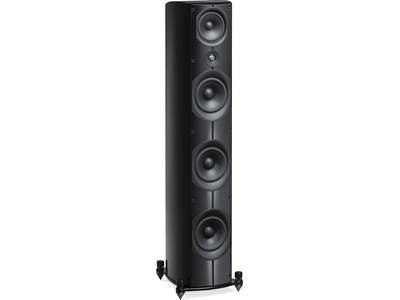 5-Way Transitional Design: The PSB Imagine T2 tower loudspeaker features an unique five-way "transitional" design for seamless frequency response and controlled directivity to eliminate unwanted reflections. The 5-way tower speaker is equipped with three 5.25" woofers, a dedicated 4" midrange driver, and a 1" dome tweeter. 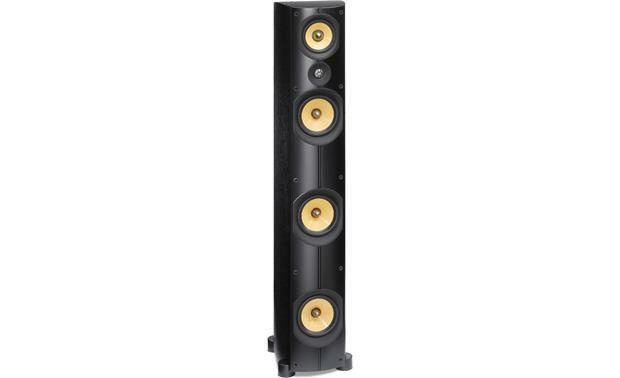 The Imagine T2 tower speaker offers a sound experience that is smooth, detailed, and real. Custom Designed Woofers & Midrange: The PSB Imagine T2 tower loudspeaker employ three 5.25" woofers and one 4" midrange driver. The woofer and midrange cones are clay/ceramic filled polypropylene and use rubber surrounds. The aluminum phase plug mechanically smoothes the response and acts as a heat sink for the voice coil, reducing power compression. Titanium Dome Tweeter: The 1" titanium, Ferrofluid cooled dome tweeter's light yet rigid diaphragm and over hung voice coil, combined with a computer optimized magnetic circuit produce an extended high frequency response that remains distortion free even at extreme volume levels. Crossover Network: The crossover is a 2-way acoustical fourth order Linkwitz-Riley type with a 24 dB/octave slope. Tight tolerances were used when choosing the crossover components; heavy multi-laminated iron cores are used for large value inductors, high gauge wire air core inductors are used for medium and small values, all the capacitors are low loss and film capacitors are used for the midrange and treble frequencies. The tweeter, midrange driver, and top woofer are crossed over at 1,800 Hz; the two bottom woofers play only 500 Hz and below. Acoustically Inert Cabinet: The cabinet is an integral part of speaker design and has a dramatic effect on the overall sound of a speaker. PSB's 7-layer laminated construction results in a solid, acoustically inert enclosure. The side and top panels are curved for added stiffness, with a wood veneer exterior. The front baffle is designed to eliminate mid and high frequency diffractions, maximizing three dimensional realism. 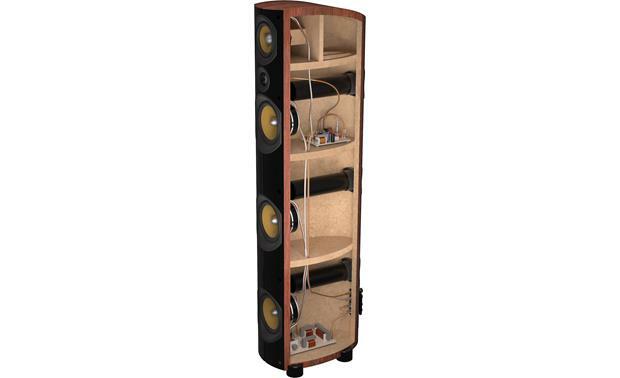 Triple Port Bass Reflex Design: The beautifully curved, hand-crafted cabinet features PSB's Triple Port Bass Reflex design and subdivided discrete chambers. Internally the cabinet has three separate chambers, each with its own port on the rear panel. There is one chamber and port for the tweeter, midrange, and top woofer; and there is a separate chamber and port for each of the two bottom woofers. This Triple Port Bass Reflex design can produce deep bass down to 34Hz. Port Cover: One port cover is included to seal one of the three ports (if necessary), thereby changing the bass tuning characteristics of the speaker to correct the interaction with the room. If needed, additional port covers can be obtained from PSB for a nominal fee. Dual Binding Posts: The dual binding post input terminals are located on the lower rear of the speaker cabinet. The two sets of binding posts are shorted together by a gold-plated jumper. With the jumper removed the Imagine T2 can be bi-wired or bi-amplified for even better sound quality. The binding posts will accept spade connectors, banana plugs (single or dual), pin connectors, and bare wire (up to 8 gauge). Leveling Feet: The Imagine T2 includes two sets of leveling feet; the rubber covered feet are used on a hard surface and add approximately 1/2" to the height of the speaker, the carpet spikes add approximately 1" to the height. HELLO PSB T2 OWNERS, The T2's keep selling out, but no one has posted a review in a year and a half. Would any recent owners like to post a review? I am interested in these speakers but would like to read some newer opinions about the T2's. THANK YOU IN ADVANCE TO ANYONE WILLING TO HELP. RESPECTFULLY, JOHN C.
I think there's a good reason they keep selling out. I have had mine not quite a year and I think they're phenomenal, especially at that price point. While not a dedicated audiophile, I am a huge music fan and I feel like I have a good ear. To me they sound full and crisp across the board. They are not lacking for bass or mids. They sound deep and the imaging is excellent. Personally, I would highly recommend them. I have had my T2s, with a C Center. I have been a semi-rabid, but real-world, audiophile for forty years, going back to when I managed a high-end audio shop. I love the T2s! They are incredibly transparent and image amazingly. They just disappear into a sound-stage that is wider and higher than the speakers, with great depth. Vocals are clear and natural; highs sparkle. The bass is solid, but I do use these with Hsu subwoofers, so I don't know how they would sound without a subwoofer. And they are beautiful and quite compact. My wife likes their appearance much more than what they replaced. She is not really into audio, but right away she was impressed with how clear they sounded to her. How does the PSB Imagine T2 Tower compare with the old PSB Silver Stratus speakers I use to have for sixteen years? I don't know how much this answer will help you after the amount of time that has passed, but here goes. The t2 is a way more advanced speaker than the stratus silvers, in every way, and even give the stratus Golds a strong run for their money. I own stratus Golds, silvers, T2's and t3's. The t2 was and is an absolutely wonderful surprise. The t2's have such a wonderful and well rounded sound. The highs are so emmedsive but in no way tinny to the ear. The lows are absolutely beautiful, musically speaking, and pack a good punch. The mids are far more refined than the stratus silvers. The speaker handles a lot of power very easily but the speaker does not have to be over driven to achieve great performance. I can say the t2's are an all around magnificent speaker and great addition to any sound system. Rather or not the t2's are used for stereo or surround sound speakers they will knock the ball out of the park. I enjoy a very broad range of music and it is amazing the amount life and pure imaging the t2's give all kinds of music: Linda Rondstat (ochrestra accompanied album), Ozzy Osbourne, Chris Cornell live (solo tour), etc... I run the speakers through a marantz av-7703, Outlaw Audio 7900 (300 watt RMS) amplifier, and NAD M51 DAC.